Motivation is not a source, it’s a result of showing up and doing. Build habits and develop self discipline with one thing at a time. When your skill level is too low for a task, you can either delegate that task or develop your skills to match it. Align your skill level with the challenge level of a task and you’re going to be extremely motivated (this is where you enter a state of flow). If there’s something you’re dreading doing, build a ritual for yourself leading up to being ready to do the work—then there’s nothing else left but doing the work. We do things when the pain of not doing them is greater than the pain of doing them. When you have motivation for something, act on it immediately. 00:57 Sean: This topic was kind of Cory’s idea. 00:59 Cory: It was. I needed to hear it, and I still need to hear it. I got some clarity last night, but I want to save that for the end of the show. I had a meeting with my friend Jonathan, and it was huge. It was really game changing for me. Hopefully it helps some people. I picked the topic kind of selfishly, because I’ve been in a rut for something like two and a half months. 01:32 Cory: No. With my personal products, I get home, and I’m just like, “Nah, I don’t want to do anything.” I need to. At the core, I really do want to do these things that I’m saying I’m going to do and that I’m setting out to do, but I haven’t had the motivation at all. There isn’t a drive to do it, where there was before this two and a half month break. I don’t know what happened. I’m not sure, but I have been in this dry zone, this desert of not doing any work. 02:13 Sean: What are you doing instead? 02:17 Cory: I’m wasting time. I’m not doing anything productive. It’s been this gap of productivity where I’m not getting anything done. That’s why I picked this topic. Let’s see what we’ve got! I’ve got some great notes and I know Sean does, too. 02:44 Sean: I opened things up by asking people, “How do you find motivation?” It seems to be elusive. We can’t seem to harness it when we want it, when we need it the most. Can I go the convenience store and get a shot of motivation? It’s not there. They don’t have it. Where do you get it? Where does motivation come from and how do you find it? The people who are motivated know that it doesn’t start with motivation—it always starts with doing. 03:20 You have to do the work. The motivation is found in the doing. People think motivation is this source. “I don’t want to do because I’m not motivated. I need motivation, and then I’ll do it.” People see motivation as a source, but motivation is a result of showing up and doing. How do you show up and how do you do when you’re not motivated? That’s the question. 03:58 One of the questions we got was from Sarah: “Doing doesn’t require motivation, it requires discipline. How do you build discipline when you don’t inherently have it/wasn’t raised with it?” The last episode speaks to this a lot (Related: e067 Sticking to a Routine and Chaining Habits). We talked about building habits and chaining habits together, sticking to a routine. 04:25 I feel like that episode addresses it really well. If you haven’t heard the last episode, go back and listen to that. As far as building discipline when you don’t have it, I think it starts with micro-commitments or micro-successes. We talked about this in the last episode. You have to start really small and define accomplishing those things as a success. You want to build discipline? Let’s say you want to do something every day. You need to have time to do that. 04:58 “I’ve got a job.” That means that you need to wake up earlier. “If I wake up earlier, I have to go to bed earlier, which means that I need to shut down in the evening earlier.” You have to start the night before if you want to have a successful morning routine. You start by saying, “I want to go to bed by 9pm or 10pm.” That seems super early! Don’t get overwhelmed by saying that you’re going to do all of these things and become super disciplined. You just say, “If I can shut down by 9pm or be in bed by 10pm,” however you define it for yourself, that is a success. Build habits and develop self discipline one thing at a time. 05:39 Cory: Absolutely. I think you have to make it easy for yourself with micro-yeses. As soon as I get home, have a list. I’m going to drink some water, make dinner, and then I’m going to sit at my desk and do this thing. Little things like getting the water and making the meal, you need to have those things planned out and written out. You’re sticking to it. You are getting the water out of your fridge or making the sandwich. You’re doing this, getting into a routine that you wrote down. Once you get to the desk to do the work, it will be a lot easier. You just follow that process of doing these smaller, easier steps of building a routine. 06:25 Sean: Let’s talk about some of the reasons Cory contributed, reasons that people are not taking action. We’re doing this show because Cory felt like he hasn’t been taking action. That’s what you said, Cory. “I haven’t been taking action on the things I want to be taking action on.” I said, “Come up with some reasons. Why are people not taking action?” You said, “It doesn’t feel good.” That’s one of the reasons. You’re waiting for it to be fun. 06:56 You think motivation hasn’t come yet, or you don’t care enough. I think this would be a good time to bring in the insights you got last night, Cory, about how it doesn’t feel good or you’re waiting for it to be fun. What did you learn last night as a result of the conversation you had? You can’t be a quitter—you have to be a pusher, to push through when it doesn’t feel good. 09:02 He said, “Don’t wait for it to feel easy and fun.” I was waiting for storyboarding, which I’ve been dreading, to be fun. When we first started, I said, “Drawing pictures!” After four hours, I thought, “This is terrible,” and we only had ten pages out of hundreds. 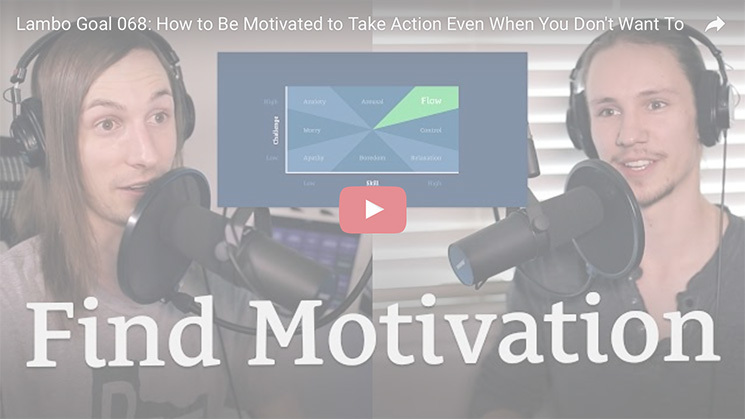 09:20 Sean: How do you find the motivation to do it when you know it’s not going to be fun? Before, you’re thinking, “Maybe it will eventually be fun,” but now you realize that some things are just not going to be fun. How is that motivation for you, instead of disheartening? 09:39 Cory: That’s totally fair. It was motivation for me, specifically, and maybe some people can relate, because I felt a comfort in knowing what to expect. There wasn’t any, “It doesn’t feel right tonight. It’s not fun today, so I don’t want to do this thing.” Having an expectation that this is the work and it’s not going to be enjoyable made me say, “Okay. Let’s sit down and do something that’s not that fun.” I don’t want to jinx anything, but I’m hoping that once I get into it, the motivation will start coming and I’ll keep doing it. Maybe it will be fun. I’m not going to count on that or promise that to myself. 10:23 Sean: I told Cory that there is a section of this show that I didn’t tell him about on purpose, because I wanted to spring it on him. I’m going to talk about entering into a state of flow and how to match the challenge to your skill level. This is basically a chart, so I’ll have to have Kyle illustrate this for you on the featured image. If you listen on the podcast app and you never go to the website, you’re going to want to go to LamboGoal.com/68 to see this. I think it will help give you some clarity. 11:19 This is from Dr. Mihaly Csikszentmihalyi, and he did a TED Talk on this. He talks about different levels of challenge. 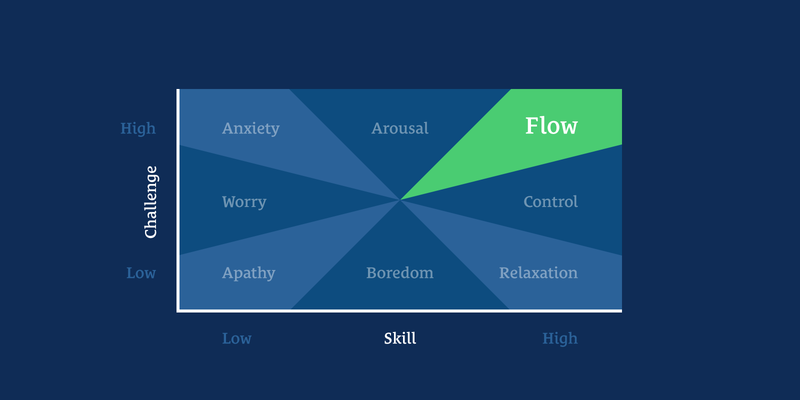 You have a low level of skill up to a high level of skill, all the way down to boredom and disinterest up to being in a state of flow. He’s got a Y axis and an X axis, but within the chart, there’s almost a pie with eight slices. I’m just going to read it out to you in list form. You’ve got things that are a low challenge level. Challenge and skills are the two axis. You could have something with low skill and high challenge, and that’s going to be very frustrating to you. 12:23 Here’s the thing. If you have something with low challenge and you have low skill, you’ll have apathy. It’s something you don’t care about. Imagine anything that’s not a challenge and doesn’t require hardly any skill. You don’t really care about it. You’re apathetic. 12:48 Cory: That’s on something that requires low skill. 12:52 Sean: Low and low. If you bring up the skill a little bit but keep the challenge low, a thing where you have mediocre skills but the challenge is low, then you’re just bored. That’s where you get boredom. You have to understand how these things align to see how we eventually get to flow. If you have high skills but a low challenge, something you’re really good at but the thing you need to do isn’t challenging at all, you have relaxation. 13:32 Cory: That sounds nice. 14:20 Even for someone who’s good at it, it’s extremely challenging, but you have no skill in that—at that point, you have anxiety. 14:26 Cory: Yeah, that’s intimidating. If you have high challenge and high skill, that is where you enter a state of flow. 14:52 Anything that you’re very good at but is also a good challenge for you, that’s where you enter into a state of flow. You are in your element. This is the thing you do, the thing you’re good at. Enough of a challenge is coming at you that you feel engaged. You enter into a state of flow. You don’t even notice time passing. You just feel like you’re in the zone. You’re in a state of flow, you’re enjoying what you’re doing, but you’re not relaxed. You’re really enjoying it. That’s a state of flow. High challenge, high level of skill. 15:32 Cory: Very interesting. I’m glad you saved that and you didn’t tell me. 15:39 Sean: The chart is also very interesting. 15:41 Cory: I could picture it. 15:44 Sean: We’ll get that for you. You can search this, too. Google Mihaly Csikszentmihalyi. Whenever you’re trying to figure out how to enter into a state of flow, find motivation, and create a scenario where you are challenged, look at something that’s challenging to you but you’re also good at. There are a lot of things that are challenging, but you don’t have skill, you have low skill, or you have mediocre skill. Or, you have high skill, but the thing isn’t challenging. When you align your skill level with the challenge level of a task, that’s when you’re going to be extremely motivated. 16:54 Again, you won’t necessarily feel motivated beforehand, because motivation is found in the doing. If you want an area where you are likely to find motivation, look for the areas where it’s high challenge, high skill. 17:11 Cory: It makes me want to think about the things I’m working on and how I’m not motivated to do them. Is it because I have a very low skill level and it is very challenging? I am starting to think that’s the case, because I’ve never storyboarded a feature length film before. I’ve never even tried to make a feature length film before. Storyboarding takes a long time. George Miller is the director of Mad Max: Fury Road—if you haven’t seen that, it’s a phenomenal movie, really beautiful. 17:44 Sean: It won a bunch of awards. 17:45 Cory: It did. Cinematography was amazing. George Miller took ten years to storyboard that. 17:54 Sean: Woah! I did not know that. 17:57 Cory: I didn’t say ten weeks. Ten years! I don’t know if I was encouraged or discouraged that I’m having such a hard time with storyboarding. It started to make sense now. Maybe this is a little above my skill level. I’m sketching little stick figures, and that has been the frustrating part. 18:22 Sean: Is it anxiety that you feel? “I think I feel anxiety because this task is so big.” Here’s the different sections: apathy (you don’t care), boredom (you’re not really challenged), relax (cool, this is easy), control (I got this), worry (somewhat challenging, but you’re not skilled), anxiety (very challenging, low skilled), arousal, and then flow. To me, on the outside, it sounds like anxiety. 19:00 Cory: It’s probably a mix between worry and anxiety. I feel like it’s something I can do, but I’m definitely not skilled at it. I don’t draw. I used to, when I was a kid. 19:10 Sean: Do you intend to do every part of developing this film? 19:18 Sean: What do you give up? What do you delegate? 19:21 Cory: Everything I can. I didn’t want to storyboard. 19:26 Sean: How do you decide whether or not you can delegate something? 19:32 Cory: The storyboard is in my head, so no one else knows that. No one else knows what I want, what I’m picturing in my mind. I can hire somebody to sketch for me. I can say, “This is what I’m picturing. This is on the right, this is on the left, here’s the frame I’m picturing, here’s the movement of the camera.” Someone could draw that. That would be ideal. I can talk and share what’s in my mind, but I can’t bridge the gap of drawing. 20:05 Sean: There are a couple of ways you can approach it. In areas where you’re feeling anxious, if you feel like this thing you know you need to do, that’s on your task list, you keep pushing off because you feel anxious about it, evaluate whether or not you have too low of a skill level and this is too high of a challenge. At that point, you can decide to do one of two things. 21:26 You go, “Oh, right. Now I get it.” Now, you have that nugget of information that you can apply to the next thing. Even if you’re not the one to do it completely, you understand it effectively enough to communicate to the person who is doing that. 21:42 Cory: That would be a great investment. If I was learning, I could do it much better on my next film. That would be great. 22:22 I’m like, “Yeah, but I have to pick the right one, the best one. I have to look into each of these. Is hiring the right decision? Is doing it myself the right decision?” He said, “Just pick one, because right now, you just told me, you’ve been stuck for two and a half months doing nothing. Your best bet is to do something. Just pick one.” It’s kind of like what Sean says, that you can’t steer a parked car. He related it to a boat, and I forget how it goes, but it’s the same idea. 22:54 The boat isn’t going. It’s anchored down. You have to make the decision to bring the anchor up and set sail, start moving. 23:04 Sean: I like this. It’s a good thing to keep in mind when you’re feeling like you literally can’t decide between two seemingly equal options. If you’re in that place, you should just choose one and move forward. Every step is forward progress. You can always pivot and course correct. However, you may be able to get a little bit more clarity on which option is better by asking yourself a few questions. 23:31 The first one that comes to my mind is, do you have the money to hire? We talk about delegating and hiring on the shows here, but it’s important that you understand that it’s a privilege that you earn. I was chronically long game, always thinking super long term. I wanted to hire a bunch of people, and I never had anyone tell me this, but it’s true. You have to earn the right to think long term, which includes hiring. 24:03 He meant that you need to cover your expenses. You need to make money now before you start thinking long term or hiring for the long term. That meant that I had to prioritize making money, even though all I wanted to do was plan for the long term, bring people on, and build big things. I had to spend the past year focusing practically on money. I needed to earn the right. In my case, I had to right retroactively, because I did hire very fast in 2015. 24:37 It’s something I learned after the fact. I didn’t want to fire people. I would rather hustle and make up the difference and cover that, but it was very difficult. With a film, assuming that it’s not funded by investors, you have to come up with that money yourself. To be able to hire, you have to have the money. To get the money, you have to focus on the money. Right now, you’ve got to be all in, very seriously focused on getting money. As Grant Cardone says, “Who’s got my money?” What can you give to someone to get money? 25:18 That way, you can hire people. If you’re not in that position, you’ve answered that question for yourself. You need to do it yourself, so you need to learn how to do it yourself. Or, you need to get money. 25:31 Cory: That is a decision I’ll have to assess. I’ll have to see if that’s something I can afford. I don’t even know how long storyboarding is going to take. 25:39 Sean: It’s not even about whether you can afford it. What are you willing to focus on right now? You have two choices. You either need to focus on getting money—for the next quarter, the next three to six months, are you willing to forget everything and focus on getting money? You would be building up a stock pile. You want to have $10,000 or $20,000, so you have to do whatever it takes to get that money now. Hustle outside the day job. Ask Sean what you can do to make extra money. 26:16 You’ve never asked me that. I’m being quiet, so it’s awkward for everyone. A lot of people don’t ask their boss. They’re not thinking creatively. They’re not going after money. If we sat down and brainstormed for 90 minutes on a Saturday at a coffee shop, we could have a plan for you to get $10,000 in the next six months. You have to decide. Right now, you have to decide whether you want to focus on making money or on learning and doing this yourself. 27:23 It’s what you want to focus on next—developing the skill yourself so you get good enough to do it, so you’re not in an anxiety state, or focusing on money. 27:32 Cory: You’ve talked about something for a number of years, which is that if you care about something, do you care about it enough to say no to it now and yes to something that makes sense to be able to do that thing later? I never fully agreed or understood that, but it’s starting to make sense. I don’t want to be making money. I want to be making films. But if I really do care about making this film, I might have to do what it takes for six months before I can start on it. 28:15 Cory: Another reason that people are not taking action is because they don’t care enough to do it. They care more about other things than the thing they say they care about doing. I wrote all of this, because I was thinking about myself. I’m not doing something because I care about being at home doing nothing more, or whatever it is that I’m doing. I don’t really care about it, or I don’t care about it enough to take action. 28:40 You have to ask yourself, “Is this really what I want to be doing? Do I need to be doing this? Do I care about it?” Your actions speak louder than what you think or say that you care about. 28:55 Sean: This was something that I was talking about in regards to procrastination. We procrastinate because we don’t actually care about the thing. That doesn’t sound like an obvious solution, but sometimes just knowing that the issue is about care is enough to help us make a change. When you procrastinate your paper in high school and you don’t do it, you don’t do it, you don’t do it, eventually, at the last minute, you do it. You’re not just going to not turn in the paper. 30:01 That’s really what it comes down to. 30:05 Sean: All you can really do is try to make the pain more clear to yourself, the pain of not doing it. 30:16 Cory: That’s really interesting. The pain of flunking that class, for instance. Maybe you have a weekly schedule where you post something, and you don’t want your audience or your followers to not see that thing on Wednesday that you promised. 30:32 Sean: Or you have 12 people on your film coming to a meeting to look at the storyboards and you don’t have them ready, and you just wasted 12 people’s time. That pain is greater than the pain of doing the storyboard, and that’s when you’ll do it. 30:45 Cory: That is exactly when you’ll do it. That’s really good. To Cory Miller’s question, what are some ways you can turn that passive motivation into action? For me, like Jonathan told me, it’s not ever going to be fun or feel good. Maybe that doesn’t work for everybody, but for me, knowing that helped me buckle down and do this hard thing. I don’t know if that helps you, Cory, but it helped me last night. I just met with him last night, and when I got home, I stayed up really late. 31:26 I was working on a video. I was sitting there, in front of my laptop, and I know that my laptop can be used for watching a movie or a show, browsing, learning, editing a video, doing what I’m supposed to do… It can do all of those things. I’m sitting in my bed with my laptop, and I’m really fighting it. It’s almost midnight, so I want to either go to bed or just watch a 20 minute show. I remember what Jonathan told me, that it’s not going to be fun. 31:59 I was like, “Yeah, right now I really don’t want to do what I have to do.” I almost didn’t do it. I didn’t want to. I’m in control here, and I didn’t want to do that. I’m sitting there fighting with myself. This is what it’s going to feel like. This feeling right now, fighting. It’s never going to be different, so I said, “Alright.” I plugged into my external hard drive where all of my video files are and I said, “Let’s do this.” I did it. Last night, I was up until 2am making a video that I’m posting today. Know that it’s hard and it’s not going to get any easier—that’s really motivating. 32:50 Sean: While you’re saying that, I have two answers to Cory’s question. The first came to me when you said that you plugged in your external hard drive. That’s a good example of rituals. There is a story of a guy who wanted to work out and he wouldn’t always do it, so he created a ritual for himself of putting on his workout clothes, tying his shoes, getting in his car, driving across town to the gym, and parking in the parking lot. He would just walk in and open the doors, and that was his ritual. 33:35 That’s the ritual. Sometimes, he would go to all that trouble, go in, open the door, walk in, and walk right back out and get in his car and drive home. He would consider that a success, because he followed the ritual. More often than not, nine times out of ten, it would lead to him working out. He’s there! The harddrive thing got me thinking about this. Build a ritual for yourself so there’s nothing else you can do but the work. 34:14 The ritual sets all of that up. You think, “I don’t really want to do this, but I’ll press play on this ritual. Maybe I’ll do it, maybe I won’t, but I’m going to press play on the ritual. The ritual is that I close the blinds, turn off the TV, sit at this chair, and I get my harddrive out of my bag. I plug it in and I set up my mouse and my external keyboard, and I call my friend or I pull up the writing app.” Create a ritual for yourself, to where you follow the ritual mindlessly. 34:52 Then you’re in such a place of readiness that you might as well do the work. That’s one. Cory asked how to turn passive motivation into active execution, so my answer is this: do it now. Strike when the iron is hot. When you have motivation for something, literally do it now. Pull over on the side of the road. Turn and go back home. Cancel your calls. Write the guide. Draw the storyboards. Make the art piece. Create your email sequence. When you have the motivation, skip the next session at the conference. Go hide away and write. 35:35 Do it now. That’s the best trick you’ll ever get. There’s a way you can set yourself up to succeed at this most often, which is to have the freedom of choice to do something now. How do you do that? Everyone’s like, “That would be great, if I had that luxury! Unfortunately, I have a bunch of work.” We all have work. What you can stop doing is this night before editing when something goes out the next day. Last minute scrambling! 36:11 Sean: Someone was asking what it’s like to work at seanwes, and Cory Miller said a bunch of good things. He also said, “Sometimes it can be stressful. It’s like we never get a break. You can’t really be off for a day, because we’re cranking out content.” I thought, that’s a shame. That’s not where I want to be. We have good processes. I’ve been putting in good processes for a few years now, and we’re in a great place. Now, I want to take those processes and advance a little bit. What I mean is, get ahead, build that buffer. If you’re putting out content, build a buffer, a queue of content. 36:54 I say four to six weeks’ worth of content, but I honestly want to get to four months. I want to know what will be going on in February. That’s where I want to be. When you’re there, when it’s Tuesday and you’re at a conference and inspiration strikes, you’re motivated to do something, you can do it right there. You don’t have to scramble for your Wednesday morning newsletter. Stop the scramble! Stop the night before writing. Stop the night before newsletter scheduling, video publishing. No more night before! Redefine what is acceptable. 38:15 That isn’t a place you want to be. You’re only there because you decided to be there. You can get out of that whenever you want to. People think of it as a success. “I got my Wednesday newsletter out! Phew. Now I can go watch Netflix.” No, you can’t watch Netflix until next Wednesdays’ is done and the Wednesday after that and the Wednesday after that. You need to see those as urget as the one that’s just about to go out. You don’t do anything else until you’re in that place. 38:48 If you do this, you will be in a place where you have the freedom of choice. When motivation or inspiration strikes, you can do it right now. I think you’re going to be amazed at the things you can accomplish. The potency of motivation is never stronger than in the moment when it strikes. If you act on it in that moment, it’s like lightening. You can write a book in a week or knock out a course in days. It’s all about striking when the iron is hot and setting yourself up to be able to do that. 39:29 Cory: I know I’ve mentioned my friend Jonathan a few times in this show. He said, “Ask yourself, do you want to be a pusher or a quitter?” When you have that motivation and you show up and you don’t want to do, it’s like Cory was saying. He doesn’t struggle with motivation, but he struggles with acting on it. Ask yourself in that moment, “Do I want to be a quitter, or do I want to be a pusher?” That’s what Jonathan asked me. Last night, I decided to be a pusher. I’m going to push past this uncomfortable feeling. That’s a great question to ask yourself. 40:30 Cory: Do you know who comes to mind when you say that? 40:33 Cory: Aaron Dowd. This guy is an action machine. He just does it right now. Okay, we came up with a good idea. Let’s act on it. He’s motivated me a lot. We worked on his new course coming out, Successful Podcasting, so I spent two weeks with him and really got a feel for his morning routine, how he thinks, and how he works on things. That was really motivating for me, to see someone else with a lifestyle of constantly doing. All that matters is what you’ve done; nobody cares about all the ideas in your head. 41:11 Sean: Nobody gives a crap about how long your projects list is, all the courses you want to make or all the books you want to write. It doesn’t matter at all. When you’re dead, none of it matters. All that matters is what you’ve done. I want a To Done list. I’m all about big plans and big lists, adding things to the To Do. What about the To Done? I want to be in a place where I can say yes to the things that I’m inspired to do in the moment, so I can complete them, I can make them done, and I can ship them out into the world. 41:51 I don’t have to worry about, “That would be nice. I would love to make this course I’m super passionate on right now, but I can’t, because these things have to go out this week,” and I’m not ahead. 42:13 Sean: The people you look up to are the people who have done things, not thought about things. I’m going to do a comment from Pam. “Whenever I find myself NOT wanting to do something, I play a game with myself… I’ll just set a timer for 15 minutes and ONLY do it for 15 minutes. Once in a while when the timer goes off, I stop and do something else. But 90% of the time I look up 3 hours later and it’s done and I feel great about it. The ‘getting started’ is the hardest.” That’s so true. 42:51 Cory: Timers are so great. I’ve done that myself, and I’ve had a lot of success using timers. 42:56 Sean: David says, “Is the concept of ‘motivation’ just a convenient way of distancing ourselves from the decision to take action?” That would make sense if motivation was a source. We think motivation is a source. If you think motivation is a source from which you get the energy to do, then it is a distraction from taking action. You have to realize that motivation comes as a result of doing. It’s found in the doing. Then, it’s not a distraction. It’s a catalyst, but it only comes after you start. 43:30 You’ve just got to schedule the starting. You have to make a commitment that you’re going to show up every day. You’re going to wake up at 6am. You’re going to write in the mornings. You have to get it on the schedule and commit to it. 44:32 “It’s something we’ve already said in this show. You don’t care. Even if I say, ‘You don’t care, prove me wrong and show me that you care,’ and you still don’t do it, then you truly don’t care about it. Forget about that thing and move on. You have no respect for it.” If we’re saying all these things and you’re still not motivated to do it, and we’re saying that you don’t care about this thing, prove us wrong and show us that you care about it. If you still don’t do the thing you’re avoiding after all of this, you truly don’t care about it—move on. 45:12 Sean: If you’re not going to do it, get it off your To Do list. It’s just taking up space, and it’s making your list mean less to you if you’ve got a bunch of projects on there that you’re never going to do. Adding a new project that you’re passionate about right now is not going to help you take action on the other ones. In fact, the other ones will keep you from acting on the new one. You look at that list, and it’s just a list of things you’re never going to do, and you remember that every time you look at it. 45:42 You have to decide if you care about it. Otherwise, it’s better to completely get rid of it. “What if I don’t remember it?” Then it didn’t matter. If it really mattered, it will come back to you. 45:53 Cory: I brought this up because this is how my mind works. I’ve searched dozens of videos online about motivation. I’ve heard what people have to say, and it’s really good stuff, but my mind is still “too smart.” It outsmarts all of the methods. All I’m proving to myself is that I still don’t care about doing this thing. I really want to bring in an answer I wrote to one more question. I think it’s really good and that people will benefit from it. 46:39 Sean: Another way to put that is, “Is this taking me where I want to go?” If we get tunnel vision and we just think, “I want to do the thing!” We need to zoom out one level and ask yourself if it’s taking you where you want to go. Is this helping you get closer to your goal? If something isn’t bringing you closer to your goal, maybe there’s something more important you should be focused on. 47:03 Cory: Here’s a great resource for finding out if you should be doing the thing that you’re doing. Cory Miller made a test for you, and it’s called The Brand Consistency Test. Go to BrandConsistencyTest.com, and it’s really cool. You put in this thing that you’re doing, and it sees if it lines up with your goals with your brand. It will give you a result at the end and say, “You might want to rethink this,” “You definitely should not be doing this,” or, “Rework things. It’s working.” It gives you a score. I thought that was really cool. He worked on that, and it turned out pretty well. That’s the Brand Consistency Test. 47:42 I tried it out, and my score was kind of in the middle. It was really cool to see whether I should be doing this thing. That’s an answer to Jordan’s question. 47:55 Sean: Cory and I need to have a talk. I was out of town at a conference when he made this. 48:02 Cory: You haven’t seen it? 48:04 Sean: No, I haven’t seen it. He sent me a screen shot of a slider at one point. I’m surprised that it’s totally available, because we should put that behind a sign up. It’s too valuable!